Thanks to semrush you can obtain data on the keywords by which users come to your site in addition to the positions you get for those keywords. SEMrush can be useful to know what the competition is doing, what keywords it uses, what positions it obtains, what approximate traffic it has, how much it invests approximately in SEM ... At the time of making reports it is very useful since you can obtain graphs of all the above comparing different websites. All data obtained are approximate, they are not always real, so the information you get is just an idea. Thanks to SEMrush I can obtain information that helps me to make reports about the competition as well as get ideas to improve other web pages. SEMrush also helps me to know the situation of potential clients and detect needs that they may have. "You definitely should try it"
Thanks so much for taking the time to create this great video review, Roman! The team at SEMrush Is thrilled that you use the tool daily for keyword research, competitor backlinks, and keyword ideas. I'm glad to hear that you have been able to make good use out of a wide variety of the platform's tools. Your feedback is incredibly helpful in making our product better with time. Thank you for writing such a detailed review - we really appreciate it! If you are open to continuing the conversation, we'd love to hear from you at mail@semrush.com. SEMrush puts all the tools you need to succeed in SEO at your fingertips. Their products stay up-to-date on the current trends in SEM. They offer training for new and current users and will even certify you in your SEO skills. We recently started using the listing management feature and this is a great tool. Some of the tools (while handy) can be a little confusing. Not all keywords are included in a report. I find that I sometimes still have to run manual searches within Google to see the ranks of specific keywords or keyword phrases. Give it a try. They offer a free version with limited results. Getting full access to their tools is worth the money you will spend. Increasing search rankings for specific industry related keywords. Easy ranking reports sent right to my email on my schedule. Local listings and managing the company information across the web. The listing management tool does this all for you in one place. "Perfect for Competitor & Keyword Research"
Being able to see which keywords are driving to a specific domain is invaluable. Also having detailed keyword research with search volume and difficulty as well as recommendations makes it essentially a one-stop solution. Also, all of the new features that have been added over the years, the keyword magic tool and the disavow tool have been life savers. Some of the reporting for competitor research may be a bit off when compared to the actual numbers. When we checked a client's ad spend it was a bit different from what was reported on SEMRush, so we need to account for estimates. Use the keyword research tool as well as the new SEO recommendations feature which is improving with each upgrade. The biggest and best new feature aside from the keyword magic tool has been the ability to monitor links to export to your disavow file. This has saved us hours of work. Keyword research is extremely important and we wanted to ensure that we're targeting the correct keywords and optimizing our pages. Also, there are always missed opportunities that we're not capitalizing on now which makes SEMRush even more valuable to us. "SEM Rush - my choice in SEO Software"
A complete suite of easy to use tools. SEM Rush is without doubt an SEO marketing dream tool. The number of clients I win because of these insights is just amazing. Granted - being a subject matter expert helps me get the most out of the product but it really is amazing and worth the effort to learn. Multiple Google Logins for one project is the biggest issue for me. For some reason the setup requires me to add Google Analytics and Webmaster tools multiple times to one project. As an expanding product it would be nice to have a better project setup process to save time. I persoanlly made the choice for this over AHREFs. I think if you want a reporting tool SEM wins. If you want a research tool only then AHrefs is probably slightly ahead. Content Research, Website Auditing and general SEO research is amazing. I also use it to report to my clients how they are progressing on their SEO results. The custom reports are really pretty good and you can customise them so your clients know what you are talking about. "long time user's review "
"Probably the only tool you will need!" With SEMrush you will be able to do so many things. I think that you probably need 30 employees to take advantage of all the features you will get with a basic semrush pro plan. You can do crazy stuff and it will save you so much time if you are trying to be the king with your websites. - it will help you improve your content so that your website will rank! - you can spy on competitors strategies. - you can spy on competitors advertising strategies. - you can run the most advanced site audits. There is no a lot to dislike, and even if you find something to dislike, just contact the support and they will do their best to make it even better. You will need to prepare yourself for a huge amount of data to study! You might not be able to do all the work that can be done alone! I was able to spy on my competitors most visited pages and backlinks and content strategies. SEMrush gave me detailed tips on how I could improve my websites in order to rank on the first page. It helps you with stuff that you as a human can not understand in order to rank. Thank you for writing this review of our product - we appreciate you taking the time out of your day to write such a detailed description of your experience. It's great to hear that you have had such positive experiences with not only the tools, but with our support teams as well! As far as your recommendations for others, did you know that we offer 24/7 live support as well as the SEMrush Academy, the Knowledge Base, and training videos? If you are interested in continuing the conversation we would love to hear from you at mail@semrush.com! "Great product for keyword research"
Provides a great deal of data in an easily consumable format and with the ability to export to excel which makes adding SEM data to our reports simple. SEMrush makes doing keyword, organic and competitor analysis lightning fast which reduces our time spent gathering data and gives us more time to work with the metrics and provide better strategies to our clients. The interface is somewhat cluttered as they've added more and more features which produce pages and pages of tabulated data. While this is critical for viewing and comprehending the important pieces, it can become monotonous over time, and confusing to remember where things are navigationally. SEMrush helps us quickly get critical data about our clients' websites that we research on a regular basis. We integrate reports from SEMrush into our monthly strategic analysis to our clients. The functionality from SEMrush saves us countless research hours and allows us to maximize our SEM/SEO budget. 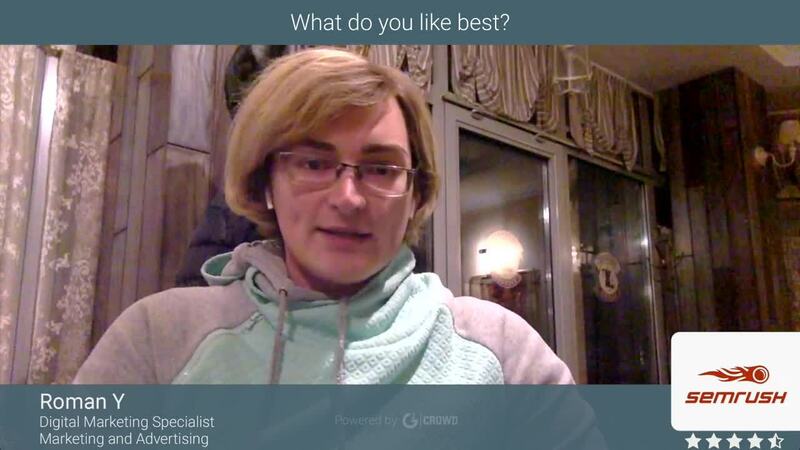 Hi John - it’s great to hear that you love SEMrush for keyword research! We really appreciate your feedback. I'm so glad to hear how happy you have been with the platform - it really sounds like you are taking advantage of the ways SEMrush can save your business time in order to focus on your clients. That’s really important for us. Hopefully this is what you were talking about, if not - we’d love to see how we can help improve. Feel free to send an email to mail@semrush.com to continue the conversation. "SEMRush Makes You Look Smart"
The Backlink Analytics tool can provide lengthy lists of competitor's backlinks that can be exported in spreadsheet formats. You can see your competitors backlink strategies including legitimate (blogs, directories) and illegitimate methods for gaining domain and site authority on Google. I also appreciate the keyword rankings, as it allows for easy reporting and tracking of SEO optimization strategies and keyword campaigns. Great tools for tracking keywords campaigns against similar business as well. The issue with all Analytics platforms is that they have, by their nature, a cluttered UI. While SEMRush allows users to customize their dashboards with the widgets of their choosing, it doesn't have a collection of custom-built templates like the Google Analytics Solutions Gallery. In short, use more contrast, negative space, and useful graphics, make it easier on my eyes. If you want a full service solution to help track, inform, and improve your SERP placement, SEO strategies, backlinks and SEM activities, this is one of the best. The backlinks features alone are worth the price of admission, allowing you to study your competitor's backlink strategies and access the same blogs and directories. SEMRush provides us with reports on SERP placement, keywords, SEO placement, competitors' SERP strategies, and backlinks. It's an invaluable tool for data which aids in analysis, guides marketing decisions and keeping clients informed of progress in SEO strategies. It was helpful to show how the results of a technical audit increased site visibility. Also good for tracking ad and keyword campaigns. Thank you for taking the time out of your day to write this review - we really appreciate your feedback on our product! I’m glad to hear how happy you are with our Backlink Analytics tool and tracking keyword campaigns. As far as what we could do to improve, this is really great feedback that I will be passing along to our developers. If you have any other ideas on how we can improve, or want to chat further, feel free to send us an email at mail@semrush.com. Thanks again for such an amazing review! "SEMRush is essential to what we do"
SEMRush goes beyond dumping a bunch of data on you. They help shape, guide, and package our research and insights into deliverables. Even our junior SEO analyst can add value immediately to our campaigns. It can be overwhelming. There is a lot of stuff and new features coming fast. I recommend starting a "Project" and move through section by section to can create a strong dashboard and insights that will make you look smart in front of clients. Try it. You won't find a more full-featured SEO tool. For us, the real switchover moment came with the reports that we could generate for clients. We were spending valuable time collecting and analyzing data, but then when we were ready to deliver our findings and recommendations to clients we were spending TONS of less valuable time packaging it up and making it presentable and consumable. "SEMrush for semantic core collection"
I really like the fact that the design of the SEMrush website is responsive. For me, it is very important that the user interface is responsive, as I usually open two windows in the browser and place both windows on the desktop. I really like the fact that the SEMrush service provides data for both Organic keywords and Paid keywords. I use Organic keywords data for SEO. I use data about 'Paid keywords' to collect keywords when the site does not yet have Google organic search engine results pages and I have the task to create an effective advertising campaign in Google Ad. Most of all I like the fact that I can find new keywords that I can use on the current pages of the site. Thus, you can expand the semantic core of your site. This allows me to significantly increase traffic on the site. In SEMrush, almost everything is perfect except for the fact that the amount of data about backlinks is usually less than that of their main competitors. SEMrush is an all-in-one marketing toolkit. But I can recommend using SEMrush specifically for the semantic core collection. Data about backlinks is better to take from other sources. I use SEMrush to search for new keywords for my site. I also use the service to search for sites of competitors that go up in the Google SERP. Then I analyze the On-page and Off-page SEO optimization of these sites. I am really happy to hear that you’ve been able to get such great value from SEMrush, Dmytro! Thanks so much for taking the time to leave such a thorough response, any and all feedback is super helpful in making our product better over time. In regards to what we could improve, I would love to hear more about the issues you’re facing within our backlinks data. What kind of data are you specifically looking for, I’d love to share this with our developers. If you’re interested in continuing the conversation, please send an email to mail@semrush.com, we’d love to hear from you! "Semrush is best seo tool for backlink creation & site audit"
"Semrush is a comprehensive SEO/ PPC tool"
Using this tool, I can efficiently manage all my on page and off page seo activities. Moreover, this tool works best for doing competitor analsis. Using this tool, we have really improved the Online presence of our website. "Best tool available... for now"
SEMRUSH is the best SEO, SMM, rank checking, and reporting tool available on the web. It offers an all in one solution for keyword research, rank checking, competitive analysis, trending, and social media reports. The interface is easy to use and support is excellent. It is very expensive for one user. Many companies are forced to share a login because purchasing additional user licenses is cost prohibitive for a small agency. Most small agencies and startups would only utilize the tool a few hours per week. Competitors are offering an unlimited user package, which is quickly becoming a tempting offer as their platforms improve. It is a very powerful tool, but also the most expensive on the market. We are able to perform almost any SEO, SMM, and rank checking needed with only one tool. "An indispensable tool in SEO"
SEMRush has now grown so that it has a feature for pretty much any aspect of digital marketing, whether that's SEO, social and PPC. The keyword tracking is one of the best elements. Daily position check on a good quota of keywords across your projects is great for quick references/health checks. The reporting element is by far SEMRush's best feature, especially if you're an agency or company that needs to produce branded reports. The reports are fully customisable and use a simple builder tool to quickly make professional and data-rich reports in minutes. The SEO audit tool doesn't feel like it's been expanded and improved much in recent years, but it's still one of the best features of the product. It's a pretty comprehensive and descriptive audit that is great for those with no to moderate SEO experience in improving SEO performance. I feel they have become to bloated and lost their focus with the product features. They are trying too hard to be able to everything to some degree, rather than just focus on doing the SEO auditing and reporting as best as they can. Originally SEMRush was loved by professionals because it was the go-to SEO audit tool, however I feel this is no longer the case. As they have tried too hard to add social, PPC and link metric tools into their product they have been left behind by competitors who can now provide more in-depth onsite audits. Their position tracking is still as good as can be, although it would be good if they could track other search engines such as Bing. Ability to keep a close eye on our SEO performance by tracking large numbers of keywords on a daily basis. The ability to create custom and data-filled PDF reports were also highly useful for internal meetings. SEO auditing for quick glances at potential new issues and alerts of competitor changes. "A Vital Tool for SEO Work"
I like the clear cut reports that I can send to clients. I appreciate being able to easily track my team's SEO efforts. And I LOVE the keyword magic tool. It makes it so easy to find new keywords! You cannot be logged into more than one computer at a time. So if you log in at work and at home, or share passwords with your team, you can find yourself logged out. Do you do SEO? Then SEMrush can help. There are other (free) tools that are helpful, such as Google's Keyword Planner and Google Analytics, but SEMrush adds additional benefits. Extremely helpful! Absolutely a fantastic tool both for the research phase of SEO/SEM and tracking the results over time. They deliver branded reports that we can then turn over to the client for review. "Great multi-purpose tool capable of much more than competitive analysis"
At the top of my list of reasons why I like SEMrush is using it for competitive analysis. However I also use it for prospect evaluations, SEO keyword analysis/research, site audits, SEO quake for chrome, and API interface to SEMrush database. I also particularly like it that the SEMrush team does not remain idle - they are constantly adding new features, and beta testing new value add ideas for SEMrush users to get more insights. There is not much to dislike about SEMrush. Whenever I am disappointed that SEMrush doesn't have a particular feature, or discover something that I wished SEMrush had, I suggest it to the team and they are very receptive to new ideas- and including the new features in future versions. If you are doing competitive analysis for clients or prospects this tool is a must have tool. The API interface is a great way to enhance links to other evaluation tools, but that part is probably is not for technically faint of heart. The site audits are fairly easy to use and exploit, for top level insights and seem to have a much greater depth of capability than I have taken advantage of just yet. Site audits are helpful for evaluating key clients, and provides on-going regular emails as to how each site is doing. SEMrush provides great insight into a prospect's pain areas, and where they might need help. It provides a data driven evaluation, that prospects appreciate when they see how their website is seen from the outside. I believe this tool helps me build relationships with prospects, that improves their confidence in my resources for evaluating their situation and to give them strategic insights. "Invaluable Tool For Webmasters & Marketers"
I like the keyword position tracker and the site auditing with the competitor comparisons. It's really useful to see where my website is with a side-by-side comparison with our competition in regards to specific keywords we're targeting. The site auditing tool helps to identify issues with the website that can easily be fixed in order to get a better grade and be more relevant on search engines. Only wish the interface was a little more streamlined and clean. There is a lot of noise on the various pages. Information overload with many tools I either don't know how to properly use (my own fault) or tools that are not useful to me. Highly recommend using it for keyword tracking and research. It's a great tool for a side-by-side comparison with competitors. SEO. We're able to track progress with keywords we are going after to see if our efforts are working. "Best analysis tool for most everything related to digital marketing"
Where do I begin? Keyword research, competitive audits, keyword tracking, social monitoring, local listing monitoring are just a few of the things you can do with the tool. It's got pretty much everything you ever need. I particularly like the historical data in the keywords report which allow you to track your historical listings/rankings on a page by page basis. Really nothing. There are some things that aren't entirely fleshed out but these tools are typically in beta. It'd be cool to have the mobile and desktop reports combined to see total search volume as well as the ability to view them individually. Make sure to watch the video tutorials and read their content on how to actually use the tool. At first glance it can be pretty overwhelming but once you know where everything is it is much more powerful. Competitive audits (keyword, shopping, social). Measuring SEO efforts and website health. "One of the best SEO Tools Available "
Easy to use & manage multiple projects. I love the interface, the help features, all of the SUPPORT with the blogs and videos. Even if you are not an SEO expert, you can quickly get inundated with all of the help available. It covers absolutely every area of SEO - social media, backlinking, tracking rankings, keyword research. And I find it to be pretty affordable compared to using multiple tools. Technical Glitches on occasion, but that's really it! This will be invaluable for your business. You will be able to better allocate all your digital marketing funds with the knowledge you gain from this program. "The best data-driven tool every marketer should have in their arsenal. " There are many aspects of the tool our marketing team enjoys. The first benefit of SEMrush is the reporting tool. The ability to create custom client reports with our logo has benefited us in many ways. Next, the topic research tool is very powerful, as we can examine what people are searching for, and potential headlines/blurbs to address their search intent. We can take this a step further and dig into keywords analytics to filter through which keywords are worth pursuing. Another feature we really like about SEMrush is the ability to analyze our competitors. Seeing what keywords they rank for, their paid ads strategy, and where they generate traffic from is powerful. We can take this data and deconstruct our competitor's marketing strategy. I think adding insight on social media ads (like AdEspresso or AdBeat) would be very beneficial. Organic traffic: we use a combination of the keyword magic tool, position tracking, website audit, and numerous other elements to create, engage, and analyze an organic strategy. Social media: we use the Twitter aspect of SEMrush the most. We track the number of total engagement, our best performing tweets, and any accounts that have mentioned us to boost our social media strategy. Content template: this is our go-to tool to create a new, long post article to make sure we're optimizing our content strategy. There are numerous other benefits of SEM. Each of the above elements can also be used to analyze competitors and deconstruct their strategy. "Excellent keyword and competitive research tool!" I've been a subscriber to SEMRush for 4 years. I love the ability to assess trends for keyword and overall traffic on the overview screen. This has been so huge in benchmarking campaign success. All the info on the keyword OVERVIEW is great. I've been able to identify strong improvements and capitalize on them. Also, it's helpful to know to see if there are any weaknesses, or improvements in my strategy to be made. I LOVE how SEMRush still has more specific and precise keyword and Google traffic volume than Google's keyword tool. This has been a lifesaver in Keyword research and campaign development. It goes down from time to time. It's frustrating, but it's not that often. Google Keyword tool stopped giving accurate traffic volume estimates a couple of years ago, and the number range has been frustratingly broad. It's been much more effective to use SEMRush for keyword research. Also, knowing the previous positions of keywords to determine advancement or decline in the SERPS is really helpful. "SEMrush: the Swiss Army Knife of SEO (and SEM) Tools. " The evolution of SEMrush over the years has been phenomenal. My first time using the product, over 10 years ago, left me slightly underwhelmed. Boy has that changed! They have evolved into a tool that I use every day and literally can't live without. At this point I'd be hard pressed to find any flaws in the product since they continually evolve and improve. If I had to pick one issue, though, occasionally the ranking tool doesn't read the SERP results correctly and reports a drop when there is none. This is relatively infrequent and something I've seen with other tools as well. Don't try it unless you are prepared to fall in love with it. SEMrush helps me as a sales tool since I can generate reports to show potential clients where their weaknesses are. From there it becomes my go-to baseline report generator. After that, it helps me identify issues and opportunities when working on a site and provides a great way to show progress to my clients. "SEMrush is My SEO Spirit Animal"
SEMrush is so feature rich it's like your most favorite desert and after dinner drink all in one - with second helpings included! The keyword data, the social posting tool, the competitor data and more is simply incredible. The training tools, special webinars, and all the support SEMrush offers clients is of tremendous value over and above all its functionality as an SEO/SEM tool. SEMrush allows me to grow my business and stay competitive in highly competitive and saturated niche. I'm grateful for SEMrush and thank everyone there for all they do to help online business grow and thrive! Other than I wish SEMrush would run a Black Friday special price every year (Any year? C'mon guys, just once! LOL) I love everything about SEMrush! Take the time to learn ALL the tools. You'll come upon opportunities to improve your site and marketing efforts that you didn't even know you were missing! Massive growth in traffic & ability to surpass competitors based on provided data Also, started working with the Social Media Posting Tool and was able to give up paying for Hootsuite as well as increase social media following. "A Must for Your SEO Stack"
The range of features, the accuracy of data, the ease of use, and ability to manage dozens of clients'. All of these features make it much easier and faster to do SEO and SEM research, audits, and creation. There isn't much to dislike. SEMrush continues to add new features and test out new tools for different types of marketers. I do wish the API was available for all paying accounts, or at least those not on the first tier. There isn't much of a consideration here. You have to use this platform if you're trying to manage clients (or for your own company). SEMrush is a must. They compliment other SEO/SEM tools, so while there might be some overlap in features, they work together. The list is enormous. We run scheduled website audits for 30-40 clients and our own website; we do keyword research and track the keyword rankings for our clients; we do ideation for content creation, ppc campaigns, etc; we do competitor research; we perform backlink audits; and so much more. "All-in-One SEO Tool for Beginners & Experienced Professionals"
The beautiful UI not only allows our SEO team to learn what's what in the SEO game much easier, but our clients love the reports! In-depth, pretty and customizable for any niche out there. What do I dislike? Sounds like a trick question because I have yet to find anything I don't like. The SEMrush Support Team is reachable and insightful and quick to help! Worth the money. No doubt about it. That is my promise. Keyword Research: a lot of clients don't know what queries to go for, they just assume their best product is what's best to focus on. SEMrush helps determine what users actually search for. Competitor Research: again, most clients don't know who their true competitors really are. Site Audit: easily find and fix crucial issues in client websites that quickly increase organic search results. And there's so much more! Semrush is one of the best alternatives for SEO and marketing research. The platform provides a wide variety of reports on almost all aspects of marketing: competitive analysis, rankings, link building, keyword research, site health, advertising and social media. And that's not even the full list! It's one of the best options for any marketer looking for an all-in-one marketing research solution. It's not easy to use right from the start. It takes a while to get used to the interface and know exactly where to look for various reports. Semrush has become a part of our daily lives at Flipsnack. It helps us keep track of trends and create marketing strategies that help position and improve our marketing strategies. "SEMRush Used for InHouse SEO and Digital Marketing. " The best tools about SEM Rush are the link analysis and and keyword analysis tools. The keyword and link reports, comparisons, and dashboards are very robust in SEMRush so you can get very broad information from dashboards are get very granular with specific back linking or keyword analysis reports. Some of the things I dislike about SEMRush are the suggestions that they provide with page checkerr etc, they are good general guidelines but don't always apply to every situation. Also some of the terminology that they use is way to niche, not even in the SEO world but niche to SEMRush. If you do In-House SEO and Digital marketing I highly recommend using SEMrush. It has great features from both a monitoring standpoint and working standpoint. SEMRush allows me to have a second opinion when it comes to SEO tools and techniques. It also provides a valuable keyword analysis tool. Additionally, it allows me to build links for local SEO which has been a huge help with local SEO link-building and monitoring. It allows me to monitor my back links in-depth to ensure that I don't have spammy or poor links connecting to my site, and to search for the best place to create new local links. "Very good SEO dashboard - good keyword analysis / awesome customer service / great overall resource"
Awesome SEO tool. I use it on a daily basis and most other SEO colleagues also use it. You can benshmark your domain with that of competitors - on different levels (PLA/Display Ads/backlinks/rankings). Very usefull and very detailed information. You can further use it to expand on the keywords and find new related ones with the keyword analysis function. Also good if you want to expand into new markets. There is not a lot you really miss. Updates are not as frequent as they used to be, but the team is always open to suggestions and actively communicating what is about to change and what they are working on. I am missing a bit the information on big changes to google and what we as end users should keep in mind when optimising the website. This could be a lot clearer. Definetly give it a try. Most features are free and a great help. I know you probably already work with a lot of tools and dashboards. But I could get rid of a few tools and now use SEMRush for it. Love it. Optimizing our website for search engines. "SEMRush is an easy to use tool"
It's easy to use to in terms of just dropping in a domain or keyword for quick metrics. I also like that you can compare 5 domains. It has been really easy for me to teach our content strategists how to use the tool, even thought they are not as technically savvy. This was the first tool I learned to use for SEO, and it's definitely easy to catch on as a beginner and you do not need extensive technical knowledge. The dashboards are a bit clunky compared to competitors dashboards and sometimes when I've clicked through the sidebar it has cleared the domain search. I prefer using Ahrefs to this tool because I think the upper toolbar presents your options better and it has an easier user interface with which to interact. Great product for the price but Ahrefs is my preference. General SEO research for writing new content pages on my company's website and looking at keyword gaps compared with competitors. It is very beneficial to see quick results and nice to be able to compare various domains in one view. An SEO tool is necessary when auditing pages on your site or other sites. I use it now internally, but used to work at an agency where I used it on websites in many different industries. It works well across different industries and has not lacked in terms of collecting more bizarre, unique terms. "awesome tool for everything SEM"
the multitude of different tools and frequent updates for additonal features is the best on the market. Also especially good when comparing your competitors with you. Also very usefull for looking at your backlinks, top keywords, site statistics etc. Use it to find relevant keywords all the time. Do not want to miss it. You can also run a SEO audit on your website . Which is OK useful. The customer service is not as good as I would like. Probably because you are not with the highest plan, the priority isnt the highest for me, but I would still like some kind of fast feedback from a representative for me and my clients. "Continuously making content marketing lives easier"
What's not to like? There are comprehensive tools to make your search engine marketing (SEM) as strong us possible. With organic and paid search insights, you can find ways to align your keyword strategy and PPC strategy to meet your budget and understand what you're up against and, subsequently need to do. Within a keyword, you can analyse the types of content you are up against: long form, white papers, long blogs, video, if the term has PPC copy topped and tailed, if a snippet exists. This is before I even get into the other tools that allow you to do more: the SEO content template builds you a content strategy straight from a keyword search by analysing what the top SERP links are offering. The paywall is a minor quibble, as software this comprehensive requires investment. However, I think a cheaper cost of entry than $100/month is warranted. Ahrefs isn't cheaper and has a less appealing interface and layout. SEMrush is aesthetically pleasing, but you need to be willing to allocate budget to it and to make use of the comprehensive array of tools it brings to the table to recoup that investment. Free plans might suit if you only want 10 keywords to look at; if not, buckle up. Use it right, and it'll be worth it. Understanding where our traffic generates from, where we stack up against our competitors and how we can overcome this. We're gaining insights on what content is working for competitors, and mapping out how we're going to overcome that. "Great Platform For A Small SEO Team"
I really like the projects you can set up in SEMrush. We have a lot of different solutions so I create projects for each one with specific keywords. Then I used the project dashboard to see how that set of keywords is ranking, trending, SEO suggestions, social etc. I also like that within the project you can see specific landing pages and what keywords are ranking for that landing page. In addition to the projects, there's a lot going on and it's kind of overwhelming. There's a lot you can do in the platform but I haven't found any helpful documentation or videos to help me through the other elements. I had a call and someone showed me the projects but then they just moved on to trying to sign me up for the business account. Set up projects - they are really helpful and you can get a lot of detailed information. I manage our SEO and I needed another tool in addition to Google Search Console. We also didn't want to pay an SEO vendor, so we decided to go with this tool to help track how our keywords were doing. We had an issue with one of our tags and our keywords dropped off completely and I was able to see that this happened because of the charts in SEMrush, and we made the needed adjustments. If we didn't have this tool that could have been left for months. "The Best Tool for Keyword Research"
SEMrush is hands down the best tool for keyword research. I love that you can do competitor analysis and find the keywords people are searching to go to your competitor's site. You can add all your projects in one big dashboard and see a quick overview of your keyword rankings (I do this every other day to check if my sites were penalized/keywords dropped). The reporting feature is also a great alternative to Google Analytics and we send automated reports to our clients. Overall this tool, along with Ahrefs are must-haves for any SEO who's serious. If you know what you're doing the price for this tool is a bargain. The keyword tracker is not the most accurate. If you want something better I suggest Microsite Masters or Pro Rank Tracker. SEMrush saves our company time and $$$. "A Must-Have for SEO and Web marketers"
Competitive analysis, definitely. SEMRush lets you compare the results from different websites, so that you can fine-tune your strategy against competitors, both for SEO and SEM. I think it's a bit expensive. I'd like they had some cheaper plans just with SEO *or* adv/SEM tools. I could have the tools I need without paying for things I don't use. I like it and it is a very good tool. But I mainly focus on small businesses, and I often find SEMRush a bit expensive. Plus, I do SEO and not SEM, and I'd pay less for a plan with SEO tools only. I recommend to do a trial first: the keyword and page analysis are amazing and I think they are really helpful when it comes to optimize every page of a website. Plus, SEMRush competitive analysis allows you to compare the SEO/SEM/domain strenght etc. performances of several websites of your choice, so that you can take action and improve your rankings. I can have a complete view on what's happening in SERPs with my site and with my competitor's and I can generate complete reports in a short time. "Great at monitoring SEO initiatives"
Easy to configure reports and notifications to let you know how new pages on your website are doing to get you to your goal of ranking for certain keywords. I also love how you can look at a cerain site and see other sites that would rank along side them for specific keywords. Has been a really reliable tool for our company over the years. Because I have notifcations set up on the keywords I'm monitoring, I'm not in SEM Rush every day and when I need to jump back into it, it can be hard to remember where things are and the reset password work flow has always tripped me up on their site. We're able to easily realize the effectiveness of the pages we publish on our website in targetting certain keywords for ranking initiatives. Organic research (for my site/competitor sites), rank tracking, traffic analytics, keyword magic tool, traffic analytics. These are tools that I use on a daily basis. new organic research, the fact that it doesn't remember my domain for organic research when I log back in, mention tracking - Google alerts is still faster, more efficient, and doesn't send emails with 0 notifications, site audit. Rank tracking in organic research should update more frequently. "Excellent all in one tool for SEO and SEM"
their tools for seo and sem are great, especially the audit tool and campaign tracking. I rely on their customer friendly graphs and competitive intelligence to show customers where they measure up to the competition and where they're performing well. It's really hard to estimate traffic to any particular site, but SEM Rush has some algorithm that calculates it. They also produce great content on their blog and with webinars. They really know who their audience is. I've also found their support to be top notch and are helpful walking you through using the tools features. Campaign tracking and SERP monitoring are also very useful. I've used the site audit feature for years now too. It's hard to dislike anything, but some custom reporting would be nice. Some sites aren't crawled yet. Keyword research feels more indirect and could be more robust like Moz. I wonder how accurate the estimated traffic is, but I feel it's the best competitive info out there. SpyFu also does a great job. Great for estimating pay per click traffic, competition, organic traffic, and common keywords. Site audit tool is also super helpful and provides specifics to help the site improve. Competitor comparisons are also exportable. Customer support is great and they also produce great content on their blog. Mainly we're trying to get business competitive intelligence from SEM Rush. It's great for estimating and approximating PPC spend and traffic. "Great product to support your client work"
What I like best is the number of tools offered to manage your client work. Two items I rely on weekly are site audits and search visibility tracking. In addition to this, there are tools offered for organic and paid competitor research which are fairly thorough, as well as optimization recommendations and backlink opportunity reports which can be useful, once the necessary setup has been process. Overall, SEMrush has become a fairly robust tool in the past couple years. I get updates from the SEMrush team about how they're improving their keyword research data, however there are still holes in the data when I process reports to get competition levels. Compared to Moz, SEMrush is still behind the curve a bit. I hope they'll continue to make improvements. From a business standpoint, SEMrush enable me to manage several clients from an SEO standpoint. Automating reports and offering remediation steps is a huge win when it comes to saving time. "An SEM tool "oldie", no longer a "goodie" for all SEM Needs"
If you've worked in SEO/SEM for a good amount of time, then you are likely familiar with the platform and tool-sets and so ease of use is decent. Specifically, the keyword comparison tools. Platform support is solid, as is there on-site knowledge base/FAQs if you do have questions. Competitive review of GA is solid. Price. Expensive compared to comparable SEO or Paid Search tools (MoZ, Ahrefs, Keyword Spy, SpyFu) that are lower in cost per month and offer more. Analyzing SERP competition is a bit clunky and other tools have better visualizations. Semantic keywords/backlinks database are remedial for 2018. Evaluate the trial version to see if it meets your company's needs before committing to a $99/mo rate when comparable or superior tools are available at much lower costs. SERP ranking. Backlink analysis. Keyword research. Site Audits. Link Management. Research. "Semrush is SEO Specialist tool"
This tool is great as it help our client websites to improve the ranking and drive results for us. This tool give us notification of high quality backlink opportunity which is great and we need not to do any extra efforts. "Semrush is best tool to build backlinks and perform SEO Audit"
"Best way to learn about your competitor's strategy"
Keyword search is a fundamental function for any SEO tool so is very useful to have all about keywords and content in one platform. In my opinion, the new SEMrush tool "Keyword Magic Tool" is very interesting and in line with the latest search trends. Keyword tracking related to news and latest trends is not always up to date, if you work on editorial field, this could be a problem. Backlink audit sensor is too much sensitive, few toxic links are enough to modify the general value. If you don't work only in the technical side of a website and to have a global vision of its presence online, you will fall in love with this marketing tool. With SEMrush I solved the problem about monitoring main competitor's sources of traffic. Benefits are multiples, I highlight: increase of organic traffic and Google ranking improvements. Technical audits are also very helpful if you work with developers. SEMrush is a all-in-one platform, you can use it for marketing, SEO and Technical improvements. SEMRush is just one of those tools that you can't live without. They have a very worthy competitor in a similar price range, but where SEMRush takes the cake is on their data for Google SERPs and SERP history. What I like best is that you can see the entire SERP ecosystem of a website from rankings 1-100. Other tools do this, but SEMRush provides way more data and updates more often than competitors. They also have multiple beta tools that eventually become fully integrated into the standard tool set. Domain vs Domain was a beta tool that has recently been fully integrated. It's very useful to see how well you stack up with competitors using this tool. My only gripe is that lower tier players cannot white label reports. Monthly reporting is an essential in agency world, so being able to white label and combine the SEMRush reports with other reports would be nice. SEMRush continues to innovate and test with their beta tools. If you use SEMRush, expect to keep getting new features! SEMRush is an all-in-one SEO tool. It helps you save on costs compared to the enterprise tools like BrightEdge and Conductor. The toolsets within SEMRush are robust enough to keep your workflow tidy and the SERP data provides key insights for planning SEO tactics. "SEMrush is great SEO audit and backlink building tool"
"Arguably the most robust SEO tool in the market"
Absolutely love their keyword research tool. Its phrase and related keywords reports give some really good suggestions and the metrics make it possible to decide upon not just the focus keywords but also some related keywords which make way for a strong keyword strategy. And, the fact that they are building a separate mobile database for keywords is also amazing. Their SEO content template tool is also a great one for beginners. You have to just put the keyword you want to rank for and the target geo and it will provide you a template to do that. It'll tell you the keywords you need to use in your content and on-page elements and the domains from which you need to rope some backlinks to make your piece rank on the first page. Also, you would absolutely love their Reports tool. It makes SEO reporting a breeze. The layout lets you bring the data on to the report in the form of tables/graphs/charts with just drag and drop. The only thing that is left for you is to analyze and summarize the data. There's nothing really to dislike about the current features in the tool. But, I would definitely like to see some more tools/features for on-page SEO and content research. Essentially we use SEMrush to minimize our keyword research time and to track our SEO efforts. The tool has been quite helpful in realizing both these objectives, so far. "SEM Rush helped me launch my SaaS Business"
The Domain Overview tools allows me to research my competitors and identify quickly the keywords they are ranking for. This allowed my team to structure our landing page content to break into those searches and take some of the traffic. MY product is niche and this helped us get found quickly and convert demos. The 5 project allowance in the base plan is light. I have a number of sites that work for me and I cannot measure all my sites without up charges. 10 would be the right number of projects so the marketer measuring their own assets have enough to support their ecosystem. Start with Domain Overviews and search your competitors. SEMRush will then help you see what is working for those sites and how you can go after some of their traffic via keywords. Also, you can see who is backlinking to those sites offering your an opportunity to try to make relationships there. Also, use the content writing tools for article and keyword recommendations and also for analyzing your content and making corrections prior to posting. Wow, that is really awesome to hear that we helped you to launch your business. Thank you so much for taking the time to leave such a well thought out response, it’s really helpful for us to have these! I’m happy to hear you’ve been able to use Domain Overview with such great success and that you recommend our content tools. It’s great to hear that we’re helping you to write better content AND that you’ve seen such a great increase in both traffic and demos! As far as what we can improve, I can totally see how that can be frustrating. Have you reached out to your account representative about this? The more we know about specific issues people are having, the more we can work on improving the tool! If you are open to continuing the conversation I’d would love to hear from you at becky.shindell@semrush.com. "Competitor Analysis Advertising and SEO"
I love the way SEMrush allow me to track and keep update on what my competitors do, I can improve my marketing actions and start a great work with my team. Getting to know everything about our industry best players. They have handly and very friendly tools to work with SEO which help us improving our work while creating articles it is the best. I also love the PPC tool they have. You must try this and will not regret. There is nothing i do no like, but i really appreciate if you can add to your features a way to see in the social media tool which post are advertised in order to evaluate my competitors where are they putting their money in which contents and what results they get. Is the best tool I could find. You can do a lot with it. Since we are an start up the main problem it resolved was getting to know our industry leaders, the business and the daily actions. We resolved our SEO problemas knowing were to start and how to do it in a step by step guide applying your analysis tools. It help us to decide and evaluate how we are going to manage our advertising campaigns and let us know which copies could be work better. Talking shortly I think this is a tool that helps my marketing department to manage everything regarding Advertising search paid media, SEO and competitor analysis. Thank you for taking the time to write such a nice, detailed review - your feedback is incredibly valuable to us so we really appreciate it. I am so glad to hear that we help keep you updated on your competitors and improve your marketing actions. I’m extremely happy to hear you love our PPC tool and will be passing this along to our team! I’m also really happy to hear we’re helping to solve your SEO problems, and that we make it easy for you with our step by step process. As far as room for improvement, that’s great feedback and I will certainly pass this over to our developers. Thanks so much for sharing that. If you are open to continuing the conversation I’d love to hear from you at becky.shindell@semrush.com! Thank you again for the nice review, Cristina. "Good tool for analysis of the competition and especially for SEO"
This tool has many functionalities (and more that are releasing). 1) Information on competition keywords and organic traffic. We can see the traffic of our competition and the keywords that have positioned and what % of traffic takes each one. It estimates the visits that any website you want to know more information about. It tells you exactly which keywords are the most traffic generated for the web you want, in any language or version of google. It gives us information about similar words or synonyms. We can make comparisons between different domains. You can get reports of what words the domains have positioned. Which has won or lost since the last time. Ideal to monitor the evolution and track a website and our competition. In my opinion, the biggest weak point is the estimate of visits made by the tool, which is not reliable at all. I have checked with domains that are making an important advertising investment, and the tool fails a lot in its estimation, giving values ​​much lower than real. Semrush offers you a trial. Try this tool and see if it is worth the price you will pay for it. Analysis of the competition for SEO and suggestions of related keywords. "Great tool for newbies, Amazing machine for professionals!" There's too much that I like, but of them, is my 'daily': I get daily reports that I've customized to show me when I've gained or lost new keywords (among other things), but this lets me quickly know where I need to optimize pages. There's almost TOO much to take in; Information overkill -- Yeah, it's SUPER granular if you want it to be, but it also takes a while to get into it to use it at that level. SUPER big agencies will love this. Mom and pop's wanting to get basic information with have to close their eyes to most of it. It's expensive, but once you're using it... even partially... it becomes invaluable. I've been able to monitor my competition, and get a better idea of what separates them (the leaders) from us (the up-and-comers). I can see how they've used AdWords -- and what's worked for them and what's not. This lets me learn from their mistakes. I've also been able to track down and disavow what I can only consider purposly-placed 'bad' backlinks by competitors trying to lower my site's credibililty. "Great for tracking and competitive intelligence"
Regular and accurate updates to search positions, the ability to create specific projects on my competition and monitor what is working (or not) for them. It's really helped me to better understand Google and how things are evolving, and accept that nothing stays the same for very long. It's helped us to get much better Visibilty as a key KPI, but allowing us to see how much better our competition was at it. Using the API for maximum tracking, things can get pretty expensive, so we've only done this sparingly as and when needed. The Social tracking right now isn't that good, although I appreciate it is in beta. It's very easy to use and has given us a great insight into Google and how things are changing, allowing us to react quickly and minimise any issues. We initially signed up after taking a hit in Google, and needed answers. Having tried Moz before and not being that happy SEMRush seemed like a good option. It turned out to be very worthwhile and allowed us very quickly to understand what had happened and what we could do about it. * We monitor all SEMrush reviews to prevent fraudulent reviews and keep review quality high. We do not post reviews by company employees or direct competitors. Validated reviews require the user to submit a screenshot of the product containing their user ID, in order to verify a user is an actual user of the product. Hi there! Are you looking to implement a solution like SEMrush?